Such has been the feeling of the Vodafone Lautoka Football sensation Praneel Naidu every year, especially on the second Sunday for the month of May. Speaking to Fiji FA Media, Naidu said he was only seven years old when he last got a mother’s love. “I lost my mum back in 2002 when I was in class two,” an emotional Naidu said. “Every year on mother’s day, I just wish my mum was here with me. I have always been deprived of a motherly love since then. “I struggled a lot from my childhood days. As everyone celebrates this Sunday, Naidu wished the aspiring ladies a Happy Mothers’ Day in advance. The 23-year-old said it had only been football that has kept him busy all throughout since his childhood. Naidu started his football career with Ba at U10 level up to the senior district team. He has also played for Labasa in 2016 and currently dons the Blues jumper. Many football pundits regard him as a lucky player as he has switched three different districts for the past three Inter-District Championship (IDC) tournaments and had won all. He played for Ba in 2015 when they defeated Nadi 2-0 at Govind Park, played for Labasa in 2016 when the Babasiga Lions defeated Ba 2-1 at the ANZ Stadium in Suva before joining Lautoka, who again defeated Ba 5-4 in penalty kicks last year. Naidu also went on to share how he was dropped from the camp when the Vodafone National U20 team was preparing for the World Cup qualifiers in 2014. “When I was in the national under 20 squad preparing for the World Cup qualifiers, I was dropped. “That time our age was such that we used to be cheeky and sometimes been indiscipline and that could have cost me badly. He regards Kumar as his father of football. “For me, from the time I started football and transitioning into the district level, it was all him pushing me forward. “From the very beginning, he had been looking after me since I have been coming from an unstable family background. “For all the moves I have been making, I always consulted him and took his advises whether or not it was a correct move. Every individual seem to have few moments in life which is unforgettable and Naidu also has a lifetime memory. 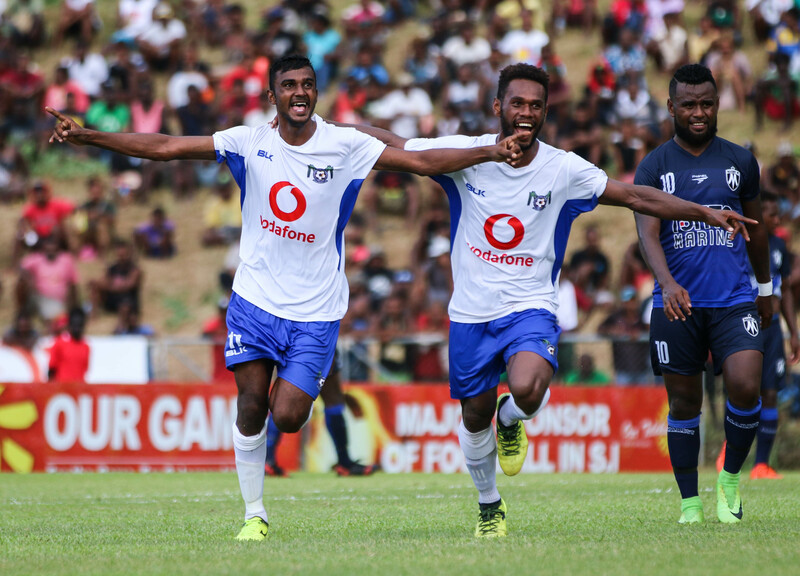 It was during the titanic battle against Solomon Islands in the deciding match of the World Cup qualifier when Naidu netted-in the winner to send Fiji to the first ever FIFA U20 World Cup. “I cannot forget that moment when we qualified for the FIFA U20 World Cup and I scored the winning goal in the final against Solomons. “We were down by a goal, and then Nickel Chand scored the equalizer before I got the winning goal through a free kick. Naidu is again the ‘talk of the town’ at the moment as he scored the winning goal for Lautoka during the second leg of the OF Champions League semifinal against Marist FC in Honiara to get the Blues their first ever final spot. He left behind a message for everyone.